Amid the grandeur of the Fort Lauderdale International Boat Show will be an 11' jewel glistening in the South Florida sun. 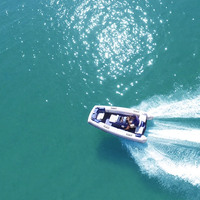 The Argos Nautic 330 Jet is a bespoke five-passenger RIB tender powered by an intercooled turbo engine coupled to a waterjet. Marrying unbridled adrenaline with lavish opulence, its FLIBS debut is at Orange Zone Land 1001.A Boating Industry Top Product, the Argos Nautic 330 Jet was designed to solve the space issues common in many 50'–70' yachts. With an innovative center console that folds down and no bulky outboard, its storage size is a mere 129" L x 68" W x 40"" H.